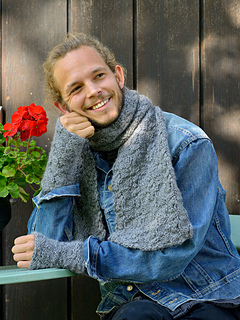 Classical, comfortable, cool; this set of scarf, wrist warmers and / or neck warmer is suitable for both women and men. The smaller wrist warmers are sized for women and the larger for men. The cable and block patterns are charted only. If you find cables daunting, the block pattern alone would create a nice texture. Easy and fun knitting. You’ll need 2 skeins (100 g each) for the scarf, 1 skein each for wrist warmers and neck warmer.